Gas mileage has always been a big part of the Toyota Corolla’s appeal. First introduced in 1968 as a modest two-door subcompact, the Corolla has grown remarkably in stature and sales, with 30 million sold from inception through 2005. It is now in its eleven generation. Although the Prius hybrid basks in the limelight of fuel efficiency at Toyota these days, the Corolla remains an economical and reliable choice. While the Corolla’s gas mileage peaked in the 1984 model year, a clean used Corolla of any vintage can be an excellent choice for folks on a tight budget. The 2013 Toyota Corolla delivers 27 city / 34 highway miles per gallon (MPG) when equipped with a five-speed manual transmission and 26/34 with the four-speed automatic. The fuel efficiency of older Corollas may be incrementally improved through the careful choice of components in routine maintenance. When it’s time to replace the tires, consider a set of high-quality low-rolling resistance tires. There are a wide range of choices, including the Bridgestone Ecopia, Continental ContiProContact, Michelin Defender, and Goodyear Assurance Fuel Max. When it’s time to replace the fluids (oil, transmission, differential), consider using synthetic fluids from Castrol, Royal Purple, Red Line, or Valvoline. Check with your mechanic and the owners forums to see which brands they recommend. Driving style and technique have a huge bearing on gas mileage. In order to get the most out of every gallon in the Corolla, consider adding an aftermarket Instant MPG gauge. Units like the ScanGaugeE and AutoMeter EcoMeter cost less than $100 and can be installed in ten minutes or so. These gauges provide the feedback you need to become an informed light-footed driver. Typical maintenance issues that can cause poor mileage in the Corolla include bad oxygen sensors (02), clogged fuel injectors, bad alignment, dragging brakes, and low tire pressure. Plastic shrouds and bits hanging below the undercarriage can have an effect on highway mileage due to increased aerodynamic drag. mmmm…mileage.my last 4 tanks squeezed tight each time gave me 34.8, 42.19, 42.87 and 40.68 mpg (US gallons). The low was mostly city before a trip, the last 3 down I-75 from north of Detroit to near Palm Beach, Florida. 90 minutes idling at customs and about 20 miles of stop and go, otherwise travelling at the limit or as much as 10 mph below the limit, never over. Cruise control on most of the time and temperatures in mid- 80s to mid-90s so a/c about half the time. Does this make any sense? Even taking into account extra weight for add safety options and creature comforts, you would think that there would be a steady incline in MPG throughout the years… So much for moving forward! Honda I would assume is the same story I know the Civic VX got well over 50mpg for the 3 years they made it…. My 1992 toyota corolla has 154,000 miles and been getting 16-17 mpg. What can I do to get more?? 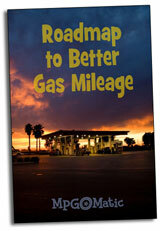 @Eric The biggest issue is the way the EPA estimated fuel efficiency. Sometime in the 2000s they changed the way they measured it from “best case scenario” to a realistic driving. In other words before they use to test around 55 mph, no winds, flat highway, no additional weight, etc… Or on dyno. Nowadays the estimated include the average of acceleration, hill climbs, and face winds. So the information from older cars isn’t comparable to the cars today in this data. And I guess it’s been changed more than one time.